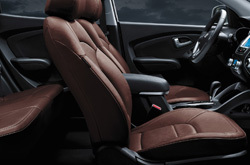 For the full 2013 Hyundai Tucson review, please scroll past the video below. Van Hyundai is a well-known Hyundai retailer in Dallas for a reason. We provide you with reviews recorded by automotive writers at the height of their craft. Once you begin to read, you'll find that this article is brimming with worthwhile features and information. As always, Van Hyundai is available seven days a week to answer any questions you might have. Don't hesitate to call and speak with a representative. When considering the 2013 Hyundai Tucson head-to-head with the 2013 Toyota RAV4, Honda CR-V and the Nissan Rogue, and you can find that the Tucson beats out those autos in several parts. Get a load of the hightlights below. 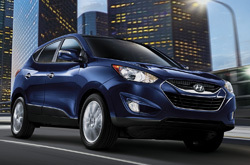 To get your Hyundai Tucson worked on by phenomenal service techs, you don't need to drive far. Our Dallas auto service center is a short cruise away and we offer a extensive warranty on every job. Your Tucson will run smooth with aid from the old pros at our Dallas service center. The following is barely a tiny part of what we handle: air filter checkups, engine repairs, battery replacement and much more. We also work on a large array of related services. From the easy to complete to the complex, Van Hyundai takes care of it all and offers cut-rate prices, customized service and old pros mechanics. Get specials day or night. You can view and print out discounts by clicking the succeeding line of text.